The formal entrance of the temple is a building with double eaves called the Hall of the Heavenly Kings (Chinese: 天王殿). This hall is a double-eaved building. 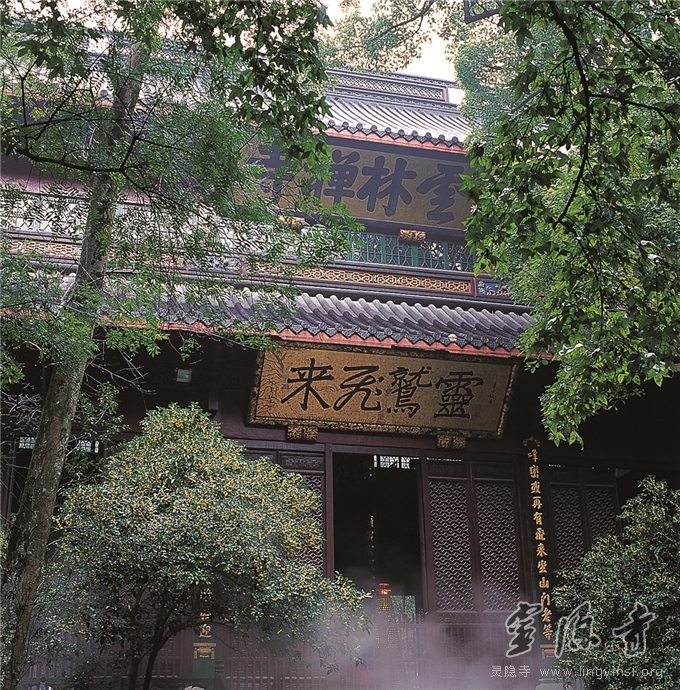 The front of the building carries a plaque (Chinese: 云林禅寺; pinyin: Yúnlín Chán Sì; literally "Chan temple of the Clouds and Forests"), written by the Emperor Kangxi Emperor. The principal statue in this hall is that of the Maitreya Buddha in his manifestation as the cloth bag monk, or the Laughing Buddha. At the back, facing up the hill, is the Skanda Bodhisattva, or Weituo as he is known in Chinese. This statue dates from the Southern Song Dynasty. Arranged along the left and right are the Four Heavenly Kings, and the ceiling is ornately painted and decorated with phoenixes and dragons. Visitors to the temple are often impressed by the size and majesty of the entrance hall and its statues. In fact, the hall of the Heavenly Kings at the Lingyin Temple is as large or larger than the main hall at many temples, reflecting its status as the center of Buddhism in south-eastern China throughout the ages..